After a period in which social unrest and an emphasis on film dominated the cultural scene, the revitalisation of Balgo painting continues apace. Two different projects are under way which will see a major contextual exhibition open in Melbourne next week and an intriguing project involving Balgo and other Indigenous artists happen in Venice during next year's Biennale. Warlayirti: The Art of Balgo at the RMIT Gallery in Melbourne will examine the aesthetic vibrancy that distinguishes the art of Balgo (Wirrimanu) and the importance of Christianity to the Balgo community, both as a driver in getting the painting going in the remote Tanami Desert community and, ongoing, as a means of cross cultural communication. The art movement began with the painting of church banners in 1981 for the German missionary, Father Peile’s jubilee, lead by the senior men – none of whom had chosen to be christened. This lead on to painting on boards and paper, which was recognised as significantly different from the prevailing Papunya styling in the watershed exhibition, Art from the Great Sandy Desert curated by Michael O'Ferrall in 1986/7 at the Art Gallery of WA. A pivotal work in the RMIT show is a painting of the first priest appearing in the desert by the legendary Sunfly Tjampitjin. Sunfly, a senior lawman and community leader, was instrumental in persuading the various groups – Kukatja, Walmajarri and Warlpiri – living across the Tanami and Great Sandy Deserts, as far away as Well 33 on the Canning Stock Route, to move into the Palatine mission when it was established at Balgo. The mission was a buffer against the aggressive practices of pastoralists in the area, becoming a refuge for people from the onslaught of white settlement. It was also, significantly, on the Luurnpa (kingfisher) Dreaming track. 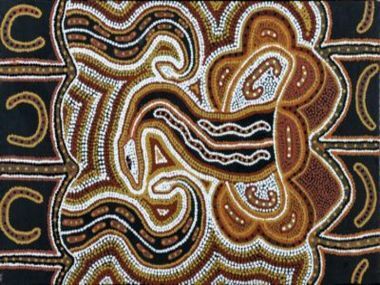 Many of Australia's most recognised artists come from this region including Sunfly Tjampitjin, Wimmitji Tjampitjin and his wife Eubena Nampitjin, Patrick Olodoodi, Boxer Milner, Elizabeth Nyumi, Lucy Yukenbarri and Johnny Mosquito. 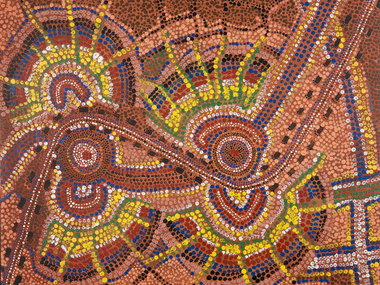 This exhibition brings together the church banners, as well as early boards and more recent canvases by the leading artists from Warlayirti Artists, one of the most successful art centres to develop in remote area Australia. It also recognises the early leadership of a young Matthew Gill, a man chosen as Chair of Warlayirti by his fellow artists, later shunned by an art co-ordinator for complaining that his elders were getting too much attention, turned to alcohol and died far too young. In 1991, Gill had caused much Catholic angst when he featured a bush-turkey as Jesus in a 'Stations of the Cross' artwork. Also featured is current Warlayirti Chair, Jimmy Tchooga – once a pioneering young banner painter. The RMIT curator, Jacqueline Healy has been visiting Warlayirti Artists annually for fifteen years and has worked closely with the committee, arts advisors and individual artists in devising this proposal. Key individuals who participated in the 1986 exhibition have been interviewed including; Eubena Nampitjin, Gracie Green, Bruce and Gary Njamme and John Tjapangarti Lewis. Important primary research material has been located in the Warlayirti Artists archives including the original documentation for the artworks in the 1986 exhibition. Warlayirti: The Art of Balgo will be accompanied by a major catalogue incorporating new research material. It travels on to Alice Springs in late November, staying at the Araluen Art Centre until mid-February. Meanwhile, later next year in Venice, an Italian-lead project which grew out of the Kapululangu Women's Law and Culture Centre in Balgo may involve Aboriginal artists from all over Australia in an installation that will try to help Europeans understand how art about land and landscape differs so fundamentally between the two continents. As Giorgia Severi – artist and curator – put it to me: “In Europe we paint the skies from the land; here the Aborigines do exactly the opposite”. Severi began her work as a volunteer in Balgo soon after she arrived here in January. At the Kapululangu Centre, she found elderly artists like Bai Bai Napangarti, Maudie Madgidell and Kathleen Padoon – some with dementia some almost blind; no longer painting, but still singing. Severi also recorded them talking intimately about their lives and went hunting on their Country to select symbols from the land – small white stones. Severi is working as well with artists from the Flinders Ranges, at Hermannsburg and Patjarr, and in NSW at the Bullarg-Nangamai Cultural Centre in Kiama, and at Outback Arts back o' Bourke. She has the imprimature of the Gervasuti Foundation to create an installation next (northern) summer in its Venice home which will include art, weaving, film and sound recordings, and maybe even a sand painting if the art centres involved can raise funds to transport the artists to Europe.